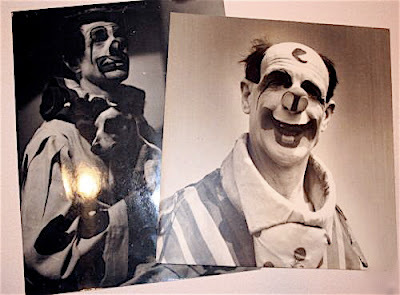 I've been meaning to mention it here for quite awhile now but for those who have not yet found it my friend Adam Gertsacov has a wonderful blog with photos and info on virtually all the leading international performers on the contemporary clowning scene. Traditional circus, new circus (neu circus? nu circus? 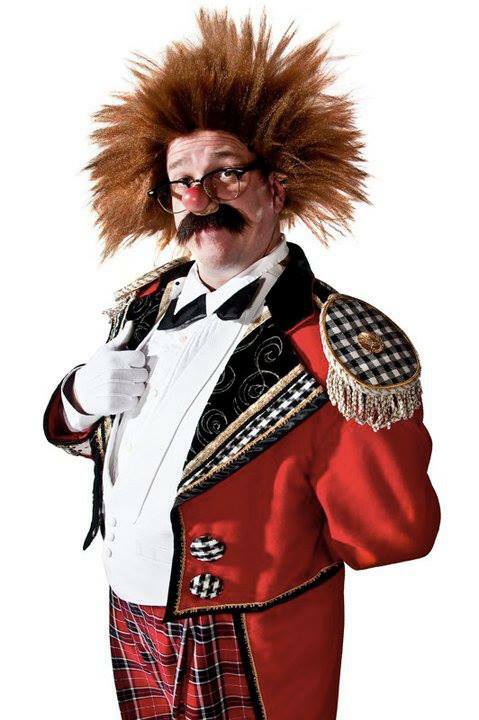 ), new vaudeville, new burlesque or legitimate (and illegitimate) stage, you'll find them all at CLOWNLINK.COM. 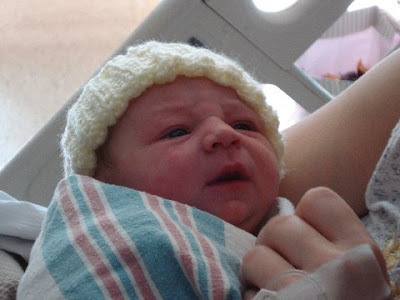 To visit Adam's blog, please click the title of this post. Kevin "Roofus T. Goofus" Bickford and Wayne Sidley. Does Wayne have his white gloves pinned to the sleeves of his clown suit? Wayne Sidley, every inch the classic American neat whiteface, wearing either one of Bobby Kay's costumes or one that looks to be made from the same fabric. For more on what Mr. Sidley is up to now, please click the title of this post. 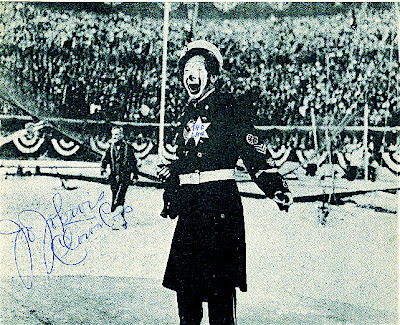 Joe Lewis, the famous cop clown, began performing in 1912 with Buffalo Bill Cody's Wild West Show as a rodeo clown at the age of 14. An enterprising youth, he used his earnings to purchase a mule and immediately used him in a comedy routine. In 1913 Joe and his trained mule act were hired by Miller Brothers 101 Ranch Wild West Show beginning a five year association with them. 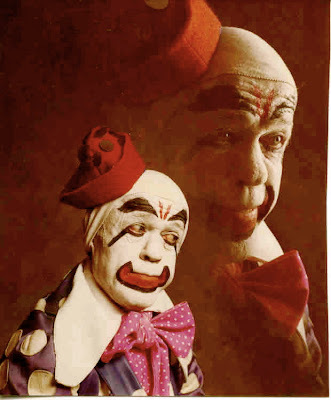 Joe then went the vaudeville route performing silly acts of mirth and playful mischief before donning makeup and running away with the circus in 1922. 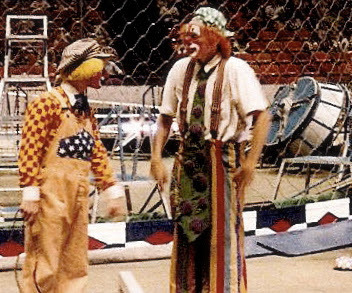 Joe was a producing clown, but he was sought and most noted for working “come-in.” Before the days of Otto Griebling’s attention getting pie pans, Joe’s bellowing voice was heard no matter how large the coliseum. Like Otto, and countless after them, he pitted one side of the audience against the other in shouting and cheering matches. Joe loved mingling with people, often assisting them to their seats. Sometimes he purposely seated people in the wrong seats and just left them there as a lark. When the rightful seat holders tried to claim their seats, he made a production of the situation, eventually hauling the patrons humorously, by the scruff of their neck, to their proper seats. Joe loved to strut about the hippodrome twirling his billy club, tweeting his whistle in an officious manner. More often than not, he would playfully whack people across the head with his sock filled billy club for the slightest provocation whether assumed or created. Joe worked all the great circuses before joining Ringling Brothers. He was well liked and respected. 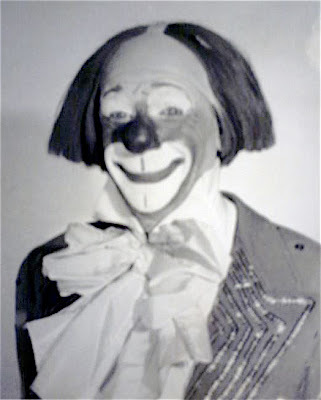 Although he worked with all the great clowns over the years throughout America, his favorite and best friend was Emmett Kelly. Whether touring or sitting in their apartments during off season, they, with their wives, often wiled evenings away playing cards. Even after he married Emmett’s ex-wife, Eva, they remained friends. 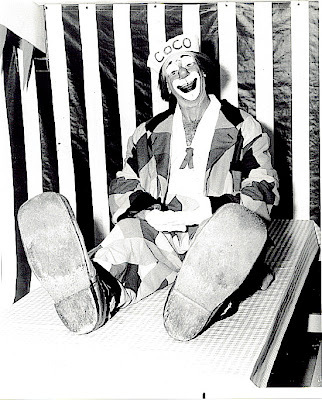 Joe was a 33rd degree Mason and loved working Shrine Circuses as well as appearing at state and county fairs across America until he retired a few years before his death in 1961. 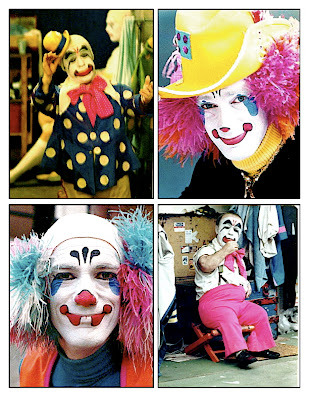 Joe, arguably considered the best cop clown in circus history, was revered across the nation by law enforcement agencies. He loved playing the St. Louis Police Circus saying it was his favorite. They likewise loved him. The most important possession of a clown is his trunk. 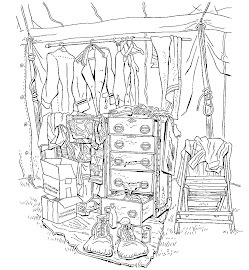 Joe’s trunk contained his livelihood and mementos, not much different than any other clown. He had his costume and the usual assortment of makeup, powder and other accessories and props, but any further comparison stopped there. Joe’s trunk was a memorial, a testament to a nation that loved him. In the top tray, he had an assortment of authentic police badges. Fifty-nine officers from all walks of life gave him their badges as a means to pay homage to a great clown that put humor behind the badge. Joe Lewis was a cop’s best friend! Joey will have considerably more to say about his step-grandfather in his upcoming book, Emmett Kelly, “America’s Favorite Clown!” If you would like to own an autographed, first edition printing, replete with a generous amount of photographs and drawings, please reserve your numbered copy via joeykellydotcom@sbcglobal.net. If you'd like to visit Joey's website, please click on the title of this post. A strange photo from Graham Coco's MySpace page of his dad from some period either in the very late 50s or the very early 60s. Dig them fancy duds! A young Slava, early in his career. Slava Polunin performing a classic bit of clowning from, what looks to me, to be around the general time period that he performed with Cirque du Soleil. Some scenes from Slava Polunin's Slava's Snow Show that don't look to be performed by Mr. Polunin himself. Sandy "Polidor1" Weber has just put a new (well not SO new...) movie up on his website. It is a sequence from a 1968 TV special called THE CIRCUS IS BORN. This clip features an interview with "Prince Paul" Alpert and shows him making up in the Alley. You can also see Frankie Saluto and (possibly) Mike Padilla in the background cutting up and trying to steal focus. To view the video, simply click the title of this post. 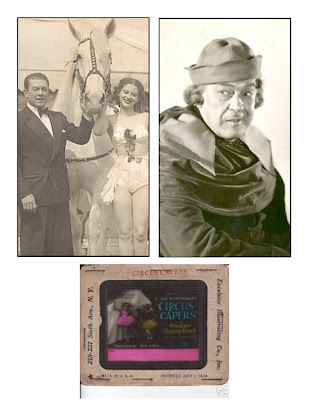 Don Covington wrote to remind me the other day that the legandary Peter Pitofsky can currently be seen performing with Teatro Zinzanni in San Francisco. For more info, please click the title of this post. Though clown discussions often tend toward the antic and Auguste, a good whiteface is a joy forever. 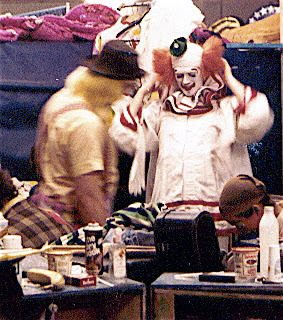 Here's a picture at the makeup table in Clown College of Richard Fick, a great clown and good man. Dean "Elmo Gibbs" Chambers and I doing Whipcracker in between arguments about how to do the gag or interrupting our arguing to do Whipcracker. David Larible performed last night at FUNAMBOLIKA. 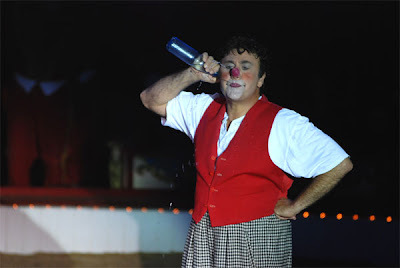 Funambolika is a new Italian festival of new and traditional circus, particularly focused on clowns. It takes places in Pescara, in the arena theatre D’Annunzio on front of the Adriatic beach. This is the same 2000-seats arena where it take places Pescara Jazz, one of the oldest and most prestigious jazz festivals in the world. Funambolika, conceived by Raffaele De Ritis, will present for the first time ever together two living legends of clowns: the icon of the avant-gard Jango Edwards and the champion of tradition, David Larible. They will both present their new open-air stage shows. In the third evening the circus school of Torino will introduce his new international acrobatic production. Pescara airport is connected daily with London, Frankfurt, Barcelona, Milano, and twice weekly with New York, Toronto, Brussel, Paris, Kiev, Moskov, etc. The Rome Fiumicino airport is 2 hours drive. 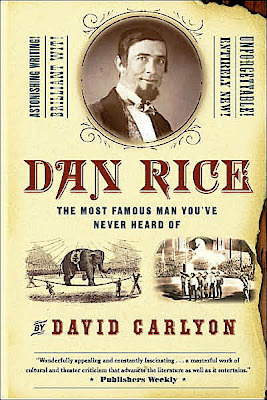 Very Happy Birthday wishes go out to Mr. David Carlyon, author of the book DAN RICE: THE MOST FAMOUS MAN YOU'VE NEVER HEARD OF, now available in paperback from Barnes & Noble (bn.com) and Amazon (amazon.com). Why not stop by his website (by clicking the title of this post) and wish the man a little Happy Happy, Joy Joy yourself? TOP LEFT: Poodles and his daughter, Gracie. TOP RIGHT: Poodles in a publicity shot for his role in the 1951 film THE GOLDEN HORDE starring Ann Blyth, George Macready, Henry Brandon, Howard Petrie and Marvin Miller. Walter "Ward" Wharton McIntyre Jr., a longtime broadcaster who entertained many children in the 1960s as "Bozo the Clown," died Friday. He was 77. McIntyre's nearly 50-year broadcasting career began while he served in the U.S. Army during the Korean War, when he developed and announced a 30-minute radio show at Fort Dix, N.J.
McIntyre's career was mostly in radio. He worked as a DJ on WSGN and WEZB. 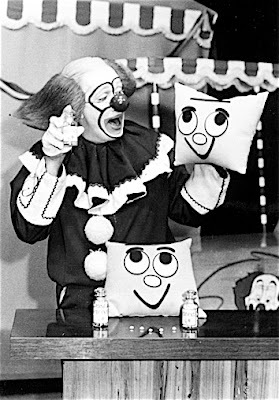 He became the lovable, red-haired clown, Bozo, on WBRC-TV in August 1962. He performed until 1968. 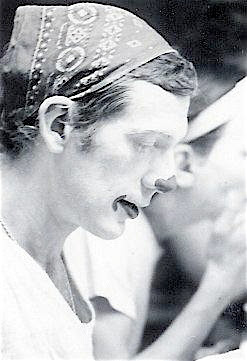 McIntyre's varied radio career included writing, producing, and doing voice-overs and advertising spots. He retired from broadcasting in the 1990s from WBHM. John Dale McIntyre, one of McIntyre's sons, said his father enjoyed drama throughout his life. 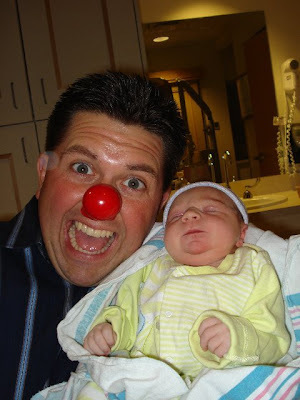 Although Bozo seems to be McIntyre's legacy, his son said he did so much more. Reading scripture each Sunday during contemporary service at his church, Canterbury United Methodist, was a joy, the younger McIntyre said. McIntyre's last reading was Sunday, July 15. "He sounded great," John Dale McIntyre said. "It was amazing. It was like he was back in the recording studio." At the church, McIntyre, a Mountain Brook resident, was an active member, serving on the church council and the drama, advertising and contemporary committees. A Birmingham native, McIntyre attended Ramsay High School and graduated in 1953 from Birmingham-Southern College. In April 1998, McIntyre and his late wife, Anne, attended the Ramsay class of 1948 reunion. McIntyre is survived by his sons, Robert Gordon McIntyre and John Dale McIntyre; and a daughter, Catherine M. Lowe. He also doted on his granddaughters. A memorial service is Tuesday at 11 a.m. at Canterbury United Methodist Church. 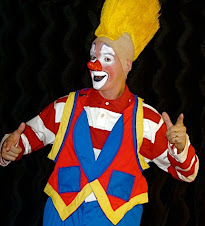 For a video remembrance from WBRC-TV in Birmingham, AL, featuring clips of Ward as Bozo, please click the title of this post. Prince Paul Alpert and Richard Fick. If you have to ask which is which, please move to the back of the class. 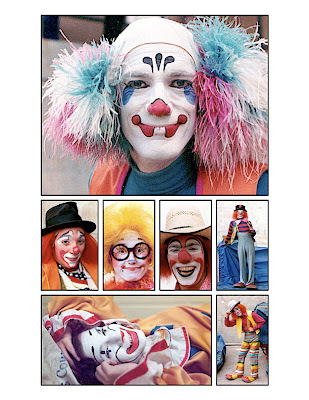 Ron "Barney the Clown" DeHoff is a 1976 graduate of Ringling Brothers and Barnum & Bailey Clown College. 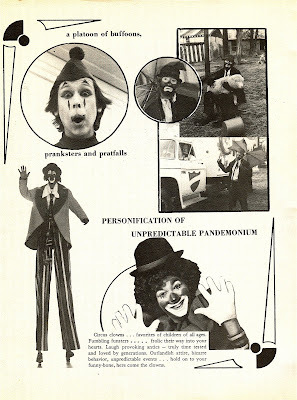 In 1977 he was Advance Clown for the Hunt Bros. 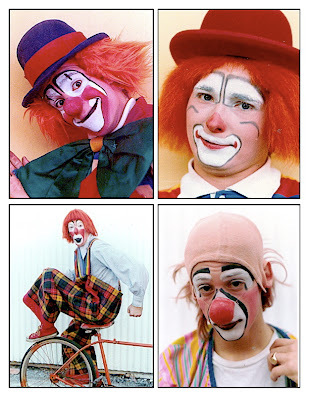 Circus and in 1978 was made their Boss Clown. Unfortunately, 1978 was the last year for Hunt Bros., which at one time had been a three-ring circus. During his time with them the show was a one-ring operated by Marsha Hunt-Jones and her husband Donald. Harry Hunt (one of the three brothers who took control from their father Charles, the founder of the show) was there as an advisor. 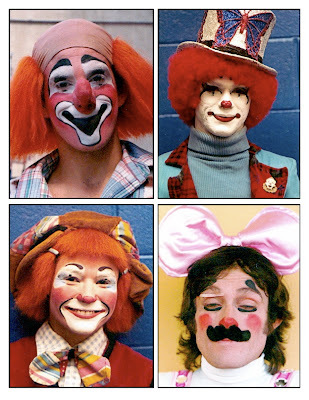 TOP: Hunt Bros. the Philadelphia Civic Center: (Left to right) Middy Streeter, Curt Detra, Ron "Barney" DeHoff, Steve Russell and unknown clown stiltwalker in the back. 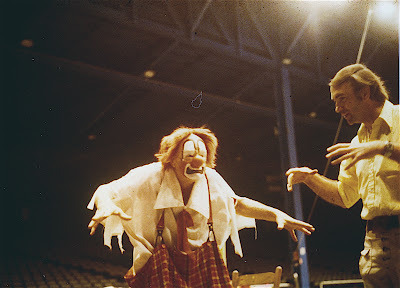 Lou Jacobs (with an assist from Bob Momyer, Assistant Dean of Clown College in 1976 and '77) demonstrating the Spider Gag. 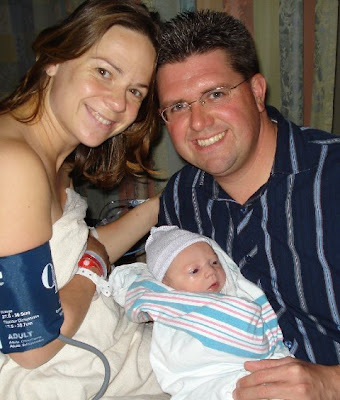 Proud parents Timea and Todd Zimmerman with baby Zoe. 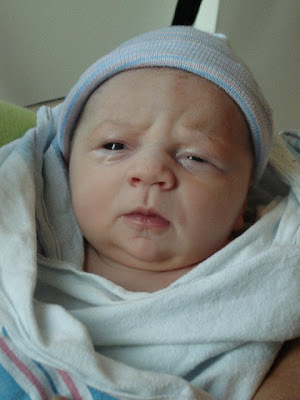 Is it just me or does she actually look more like Thom Wheaton? That's the slogan of Circus Sarasota this year, and Chuck Sidlow says it's directly tied to its creators' feeling about what they're doing. "The circus is an art form," he said to a select group who had been invited inside the tent Friday morning for a special presentation. It was, therefore, totally natural that they, visual artists from Art Center Sarasota, were there, continuing a collaboration that has proved fruitful for both sides. It's the second year artists have been invited to come and photograph or sketch performers. 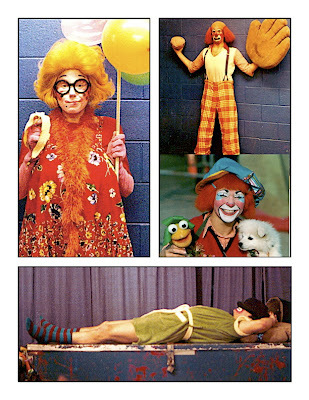 Sidlow, a veteran clown and performance director for Circus Sarasota, invited his "chosen brother" Cowboy Mike Keever in from Missouri to be the star of the event. 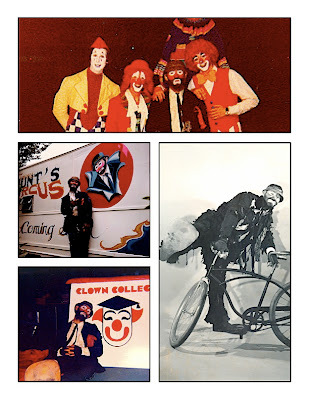 Keever, who performed with Sidlow for years as part of the Ringling Circus Red Unit, has recently turned to expressing himself with acrylic paints, and the show began with an exhibit of Keever's work set up on the circus ring. All of the colors in his paintings evolved from clown colors, with brilliant blues, reds and yellows emoting in sometimes surrealistic canvases. Then he set about showing the artists how he uses his face for a canvas, and the artistic deliberateness with which he designed his cowboy clown character and makeup. As Madeline Ferraz and Joan Bisser sketched Keever's transition into "real-life cartoon," Sidlow sat down next to his longtime buddy and waxed poetic to the intimate gathering about the difference between entertainment today and then. The two also entertained the crowd with the story of their visit to the White House lawn -- their mule got loose and they did an unintentional comedy act, trying to save the animal from a very nervous Secret Service. The event ended with an athletic performance by Damien Boudreau and Genevive Cliche. The gymnasts methodically stretched before doing a series of moves and answering questions. It was just part of the "behind the scenes look" that Marilyn Olsen, one of the artists, said she loved about the presentation. We have plenty more Elmo shots to get us through the next week or so but if anyone else, from any show, anywhere in the world, has any photos that they'd like to add please send them as a jpg. file to cashincomedy@yahoo.com. 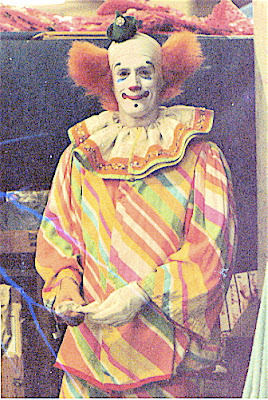 Host of the three ring CTV show CIRCUS in the 1983-'84 season, Roger "Rumpy the Clown" Prystanski. 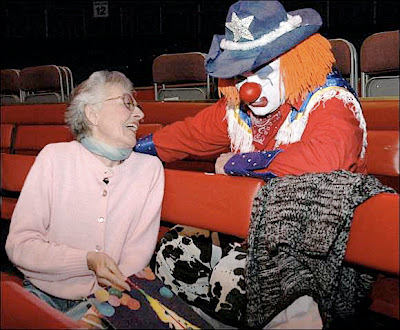 He started out as a graduate of the Ringling Bros. and Barnum & Bailey Clown College, moved to the Shrine Circus and spent many years with the Garden Bros. Circus. Always original and unique, Roger died of pneumonia shortly after this interview in 1991. It's not the best interview. The person conducting the interview doesn't know much about the circus outside of the TV show and Roger doesn't seem particularly interested in being interviewed. But, it's what we do have and sometimes we should be thankful to have that. 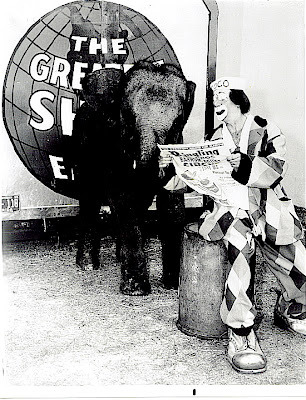 The show CIRCUS can still be seen on Canadian TV in syndication and Garden Bros. Circus still uses Rumpy in it's logo.